How we feel determines what we eat, and in turn, what we eat affects how we feel. We want to feel good, so we should eat food that gives us the emotional response we want. However, when we’re feeling low, many of us grab chocolate because that’s what makes us feel better (emotionally). Let’s take a look at natural ingredients that will make us feel better on the inside. 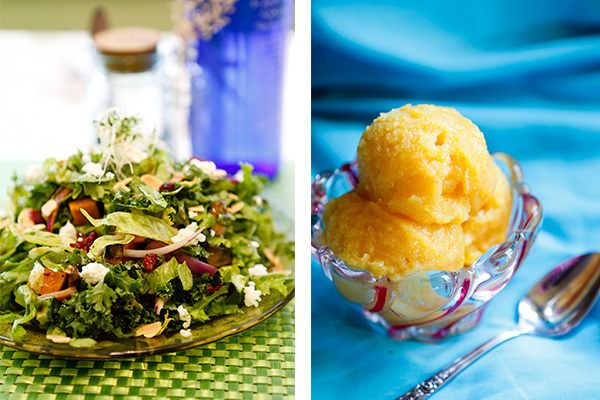 These super foods and recipes make us feel pretty just looking at them. Stock up on these 10 superfoods. Although there are many more, you can start by eating these regularly to help yourself feel and look better than ever. Blueberries are the ultimate immune-boosting food, rich in antioxidants. Brazil nuts (even just two or three a day) have a great combination of immune-boosting nutrients: Vitamin E, selenium and B vitamins. Garlic strengthens the heart and blood, and has anti-bacterial, anti-fungal and anti-viral properties. Ginger stimulates the immune system and circulation. Grapefruit has immune-boosting, antiseptic, wound healing and anti-bacterial properties. Honey is a source of carbohydrates, containing natural sugar. The vitamins present in honey are B6, thiamin, niacin, riboflavin, pantothenic acid and certain amino acids. The minerals found in honey include calcium, copper, iron, magnesium, manganese, phosphorus, potassium, sodium and zinc. Leafy greens come in tangy varieties, such as chicory and endive, and stimulate the liver, making them great detoxifiers. Kale contains a phytonutrient that appears to lessen the occurrence of a wide variety of cancers. Most lettuces contain valuable amounts of vitamins, minerals and antioxidants. Limes are high in Vitamin C and antioxidants. Olive Oil contains monounsaturated fatty acids (MUFAs), which are actually considered a healthy dietary fat. Quinoa is a grain crop that is grown for its edible white, red or black seeds. It contains protein, fiber, manganese (58 percent of the RDA), magnesium (30 percent of the RDA), phosphorus, folate, copper, iron, zinc, potassium and over 10 percent of the RDA for Vitamins B1, B2 and B6. Quinoa contains large amounts of flavonoids, substances that neutralize free radicals and are believed to help fight aging and many diseases. 1. Toss cooked and cooled quinoa with the olive oil and some sea salt (and other spices like cinnamon and turmeric, if you are feeling adventurous), then spread on parchment lined sheet tray. 2. Bake at 350 degrees until a little toasty (about 5 minutes). Cool and toss all salad ingredients with dressing. 1. Whisk all ingredients, sans oil, together. 2. Slowly add olive oil, while whisking (or in food processor) in steady stream until emulsified. 3. Season with sea salt and white pepper to taste. 1. Process grapefruit zest and organic sugar in food processor, pulsing until fragrant. 2. Add all other ingredients and bring to a boil for 2-3 minutes. 3. Chill. Process in ice cream maker or freeze into popsicles or granite (by freezing in a pan and scraping with a fork every hour). Thanks to Jen Richards, owner of Rainbow Café in Pine Island, for sharing these recipes. Dawn Sanborn is a professional photographer and foodie to the hilt. If you stop by her house she may just make you a gourmet meal. This entry was posted in Food on May 18, 2016 by Dawn Sanborn Photography by Dawn Sanborn Photography.